Inspired by Lewis Hyde’s beloved classic “The Gift: Creativity and the Artist in the Modern World”, GIFT is a tribute to something that can’t be measured or counted, bought or sold. An intimate exploration of real-life gift economies, it’s a reflection on the creative process, the reasons we labour in service of our gifts, and a celebration of the imagination. 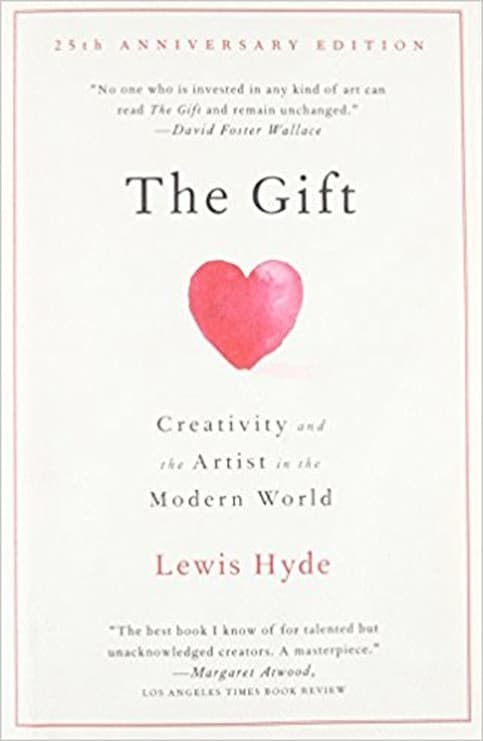 By now a modern classic, The Gift is a brilliantly orchestrated defense of the value of creativity and of its importance in a culture increasingly governed by money and overrun with commodities. Widely available again after twenty-five years, this book is even more necessary today than when it first appeared. An illuminating and transformative book, and completely original in its view of the world, The Gift is cherished by artists, writers, musicians, and thinkers. It is in itself a gift to all who discover the classic wisdom found in its pages. On North America’s Pacific Northwest Coast, a young indigenous man undertakes the elaborate preparations for a potlatch – to make a name for himself by giving everything away. In Rome, Italy, an occupied factory becomes a home for migrants, protected by a “barricade of art”: a model of resistance, and an invaluable gift. In the “pirate utopia” of Burning Man, a mutant bumblebee art car distributes honey in a post-­apocalyptic desert landscape. Meanwhile, in Auckland, New Zealand, artist Mingwei Lee prepares to launch Sonic Blossom – a “transformative gift” of song. Mahi Rahgozar has been editing films in all genres for the past 20 years. She has an impeccable sense of story and pace and a relentless eye for detail. In Denmark, Mahi edited the short comedy This Charming Man which won an Oscar in the “Best Short Live Action” category at the 2002 Academy Awards. She since has edited a number of award winning films, both documentary and fiction – including the feature documentary Bee Nation, opening night film of the 2017 Hot Docs International Documentary Film Festival. Mahi now lives in Toronto, Canada. Nicolas Canniccioni is an award-winning cinematographer, based in Montreal, Quebec. His credits include The Demons, Gerontophilia, Come Worry with Us!, Those Who Make Revolution Halfway Only Dig Their Own Graves, and The Little Girl Who Was Too Fond of Matches – and others shown at Cannes, Berlinale and festivals worldwide. Opening in Montreal at Cinema du Musée, Feb 8 weekend! Opening in Calgary at the Globe Theatre, Feb 22. At Cinequest festival in San Jose, CA: March 10, 12 and 14: tickets here. Our distributor in Canada is Cinema Politica: more info here. To book a community/theatrical screening in Canada click here. Educational screening here.